Consider the Oyster Stew: my re-creation of Mama Zu's version. Granted East Coast seafood doesn’t usually compare to our abundant Pacific Northwest offerings: orange-red wild salmon, Dungeness crab, mussels, halibut. We even have our own respected local Yaquina Bay oysters there. But I might just prefer those plumper Chesapeake Bay oysters I indulged in while back here in Virginia. I got a mad craving for these luscious, briny mollusks while savoring MFK Fisher’s Consider the Oyster on the plane from Oregon to Baltimore. It’s hard to believe she produced such celebratory prose while facing the imminent death of her true love in war-torn 1941. Fisher’s musings on the gastronomical pleasures of oysters made me lust for this most sensual of foods. She aptly describes the “three kinds of oyster-eaters: those loose-minded sports who will eat anything, hot, cold, thin, thick, dead or alive, as long as it is oyster; those who will eat them raw and only raw; and those who with equal severity will eat them cooked and no way other.” When it comes to oysters, as with all foods, I’m an omnivore, but I do prefer to slurp the freshest specimens raw. If they aren’t freshly shucked, my dad’s Mexican oysters and now oyster stews are my favorite cooked preparations. And of course I love them fried, if they aren’t too greasy, the batter light and slightly spicy. My grandparents contracted a bad case of hepatitis from some type of raw shellfish, so I try to avoid suspect ones. Reading Fisher made me want to make a velvety oyster stew, that elegant “supper to sleep on” that I’d hardly eaten before. But there it was calling out to us this week at Mama Zu’s, our favorite no frills-yet-decadent Italian spot. What gave the creamy, smooth broth its piquancy? A pancetta base and crushed red pepper, obviously strained out, the waitress said. I had to recreate it. Oyster stew recipes are as numerous as clam chowders, varying by region. 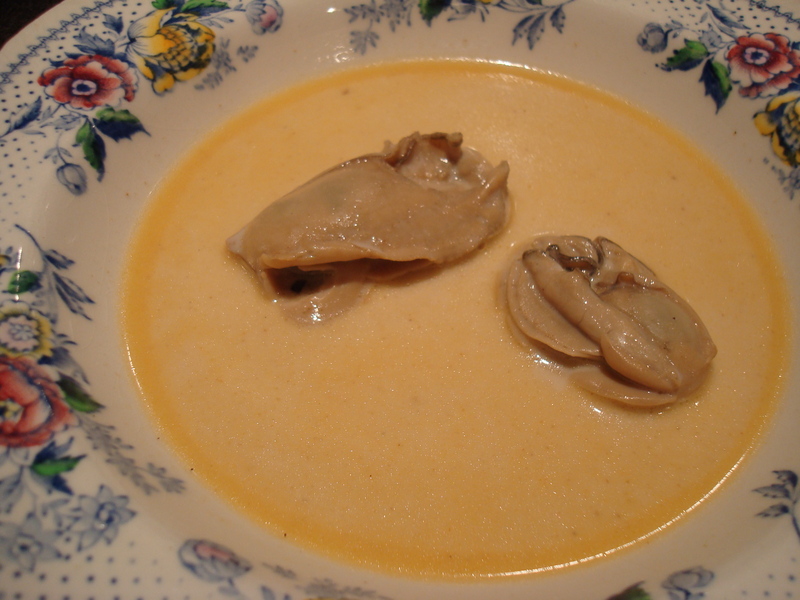 Despite its simplicity, oyster stew gives the cook plenty of options, Fisher says. How do you assemble your ingredients? Boil the oysters in their own liquor first, and then add the creamy broth? Saute the oysters in butter first, until they furl? My father the chef recommended the latter. I fried up some pancetta, added the oysters and sizzled them with some dried chipotle peppers for a kick. In a separate pot, I boiled the oyster’s liquor, skimmed off the foam, added heavy cream and whole milk (healthy, I know), a pat of butter, celery salt and salt and pepper to taste. Feel free to substitute/add other spices, such as paprika. I simmered this broth and then added the oysters when ready. For a perfect texture you could strain the broth first, but I didn’t care. Here’s to oysters for the rest of these winter “r” months. In truth, oysters are fine to eat anytime they aren’t diseased, but Fisher explains why oyster farmers have urged us not to consume them in the warm summer months. That’s the only time the ocean waters are warm enough for the oysters to spawn. Hence the rule. Indulge while you can now, comfort yourself now while the fields lie fallow, and then let our “indecisively sexed” friends reproduce in peace. Summer’s bounty will be enough to distract us then. 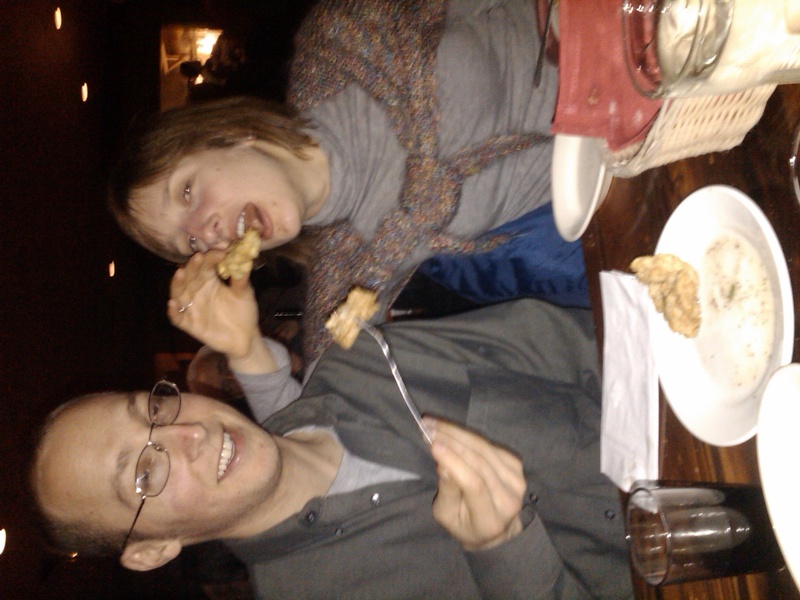 Fried oysters at Mama Zu's. Apparently they’re quite famous for their Oyster Stew. You never know what will turn up on the menu there. Did you ever try their Spaghetti Caruso, with chicken livers and mushrooms sauteed into the tomato sauce. It’s surprisingly good.